Polly. We Miss You Already. 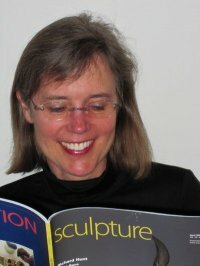 It is with great sadness that we recognize the passing of a friend and stalwart of the Chicago art world, Polly Ullrich. Polly was amazing and her passing is a loss to our art world and local community. She was kind, thoughtful and often set an example that was so blindingly hopeful that it was hard not to follow. I will forever remember her curiosity, interest, enthusiasm, and commitment to fostering a critical community. She will be missed by all of us that knew her and by this community. The following shared thanks to her husband David Ullrich. Â Â Â Â Â Â Â Â Â Â Â Polly Ullrich died suddenly on July 6, 2011, in Woodruff, Wisconsin, from injuries suffered in an automobile accident.Â Pollyâ€™s life was a relentless and intense search for meaning and beauty in art, literature, music, and most of all, in relationships with people.Â She had the unique ability to capture the meaning and beauty in words in a way that helped others understand.Â She brought insights and boundless joy to every life she touched.Â Â She was the dear spouse and friend of her husband David and loving mother of their son Eric. Â Â Â Â Â Â Â Â Â Â Â Polly was born in Wisconsin Rapids on July 27, 1950 to Phyllis and the late William Huffman.Â She was an outstanding student and excelled in journalism, forensics and theater productions at Wisconsin Rapids Lincoln High School, where she graduated in 1968.Â A significant experience during her youth was at Camp Manitowish in Boulder Junction, WI, where over six years she developed her personal strengths and love of the outdoors.Â She went on to the University of Wisconsin, where she majored in journalism, receiving a bachelor of arts in 1972 and a masterâ€™s degree in specialized reporting in 1973.Â During college, she was an active member of Kappa Kappa Gamma sorority and served as a page in the Wisconsin Assembly.Â She also wrote for the Daily Cardinal in Madison and for Time magazine.